Wearing: Lookbook Store heart print romper, Vienne Milano "Claudia" black pantyhose, thrifted vintage t-strap heels, Deux Lux bag. Today was the first day all summer where I felt it was acceptable enough to wear pantyhose outside... thank the lord! I always love wearing hosiery as I think it can make an outfit so much cuter, but in the summer it's just way too hot for that. September is here which means nothing if you live in Florida like me, but I'm trying to put myself in the mindset of fall styles, and thinking up ideas of how I can wear fall pieces and dress like it's fall, except in almost 100 degree weather. I'm just gonna start leaning towards darker colors and outfits that look good for all year long, like this adorable little romper here from Lookbook Store. I'm not big on rompers because I feel like they look unflattering on me so I don't own many, but I just couldn't help myself with this one. 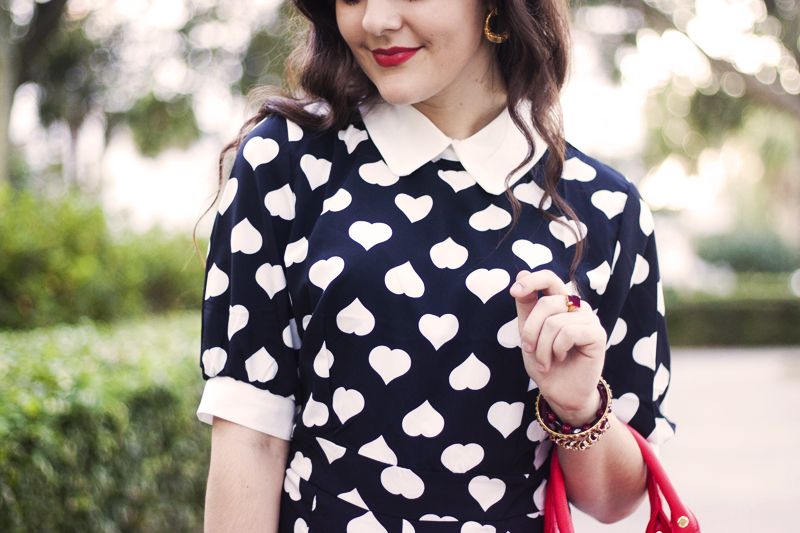 I love the classic style of it with the white collar and cuffed sleeves, and the quirky, bold heart print makes it that much cuter! I paired it with my Vienne Milano pantyhose this time around, and I would like to mention how impressed I am with these pantyhose! I wore them to my concert the other day, and I definitely was rough with them, accidentally of course. I knew that when I left they'd be all torn apart, but they had a few minor snags, nothing major or noticeable at all. All pantyhose I've had in the past snag so easily that they're pretty much done for after one day of wear, so I will admit here that I'm officially done wearing any other brands of pantyhose except for these! Anyways, sorry for the super long text, but I'm just loving the clothes I'm wearing today! 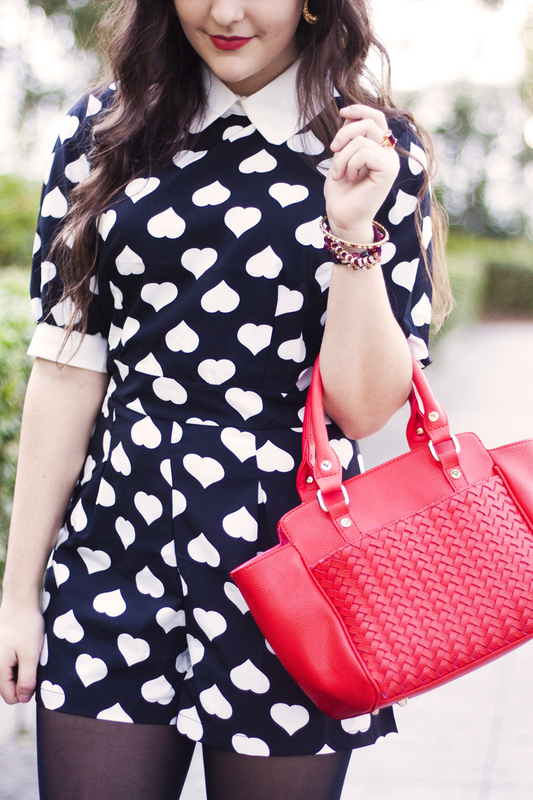 Super cute outfit, I love the romper! This is gorgeous! Love the jewellery too.